Ach wrote: But we never mention when refs favour us. It's the gw way. Is the game still about putting the ball between the two posts and over the line? Miss the first half then? And a penalty is always a goal isn't it? Wonder if anyone will ever miss one ? You ain't gallas are you ? Ach wrote: No. It was a shocking performance in the first half which was when my post was made. A great 2nd half doesn't make our first half good. And we should have conceded a penalty hence the deserve to be 2 down comment. But we never mention when refs favour us. It's the gw way. An overall amazing 90 minutes and a 3-1 scoreline with 3 GOAT goals make the game a great one. Re pens, Yeah we do. It was a nailed on penalty from what I saw and there were plenty of posts confirming that or stating how lucky holding was. Then again so was lacazettes v Chelsea (?) which wasn't given and only a handful called it. Guess that's also a GW trait? Had to be fkin JayRam right?? How anyone can sleep on Auba, his record alone should make you slap yourself, guy comes on with a cameo and scores more goals than Giroud would over a whole 90mins + ......... or season at this rate. I believe I said that Auba should be dropped after a few games and I'd prefer Nketiah to be given a chance - Auba was dropped, though Emery went with Welbeck getting more game time (which has worked out well). Either or is fine, but Auba as a sub is our best option. 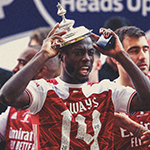 He has improved, though, after a dreadful start to the season...and yes, I still want to see Nketiah given a chance.. he's going to be our starting striker at some point and he does have more talent than Auba...you guys just haven't quite realised just how good Eddie is yet, but you will.